A green and tree shaded community in an otherwise dry plain, Vernal is an attractive small town with some 8,000 residents. It serves as a good base for visiting nearby Dinosaur National Monument, Flaming Gorge National Recreation Area and the Uinta Mountains. It offers a decent selection of motels and has numerous small restaurants, cafes and fast food joints. It also has a small, well-done prehistory museum, a couple of movie theaters and water slides for the kids. Vernal is located along Hwys. 191/40 in the northeast corner of Utah. It is southeast of the Uinta Mountains, 20 miles west of Dinosaur National Monument and 35 miles south of Flaming Gorge. 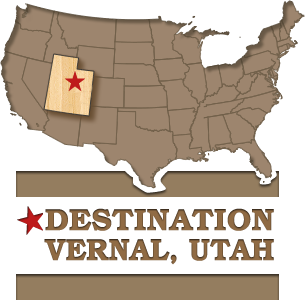 Two international airports, Salt Lake City and Denver, are within driving distance of Vernal. Great Lakes Airlines provides daily direct flight service between Denver International Airport and the Vernal City-Uintah County Airport. The Vernal City-Uintah County Airport is open to the public. Major airlines provide daily flights from Denver and Phoenix to Grand Junction, Colorado. Grand Junction is a scenic three-hour drive from Vernal. American Spirit (www.americanspiritshuttle.net), (970) 523-7662) offers scheduled shuttle service between Grand Junction and Vernal. We recommend flying to a major airport and renting a car. With so much to see and do in the Vernal area, it is a good idea to have your own vehicle. River Runners Transport – (800) 930-7238/www.riverrunnerstransport.comCustom rental and shuttle services for river runners. Greyhound - Bus service to and from Vernal is available through Greyhound Lines, Inc. (1-800-231-2222) with two full stops each day to both Roosevelt and Vernal. Amtrak - (800) 872-7245 / www.amtrak.com – Drops off 152 miles from Vernal in Grand Junction, Colorado.